A comfortable and cosy base for those missing the bonhomie of home. 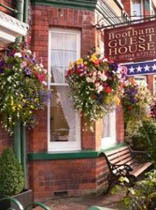 The Bootham City Centre Guest House offers affordable bed & breakfast accommodation in a handy location. There’s a bit of a home from home feel about the place but that’s no bad thing if you find yourself exploring the city alone and miss that cosy familiarity. This is a family-run bed & breakfast guest house just around the corner York City Football ground. You have several parks in the neighbouring area including Homestead and Clifton. York City Centre is about 15 minutes walk, perfect if you want to pick up a bargain or two in the ‘Shambles’ shopping arcade or visit the Jorvik Centre. The rooms are tastefully decorated and the furnishings stylish and modern and the hospitality is second to none. Breakfast is served in a small but perfectly adequate dining room and there are some good vegetarian and light continental options.